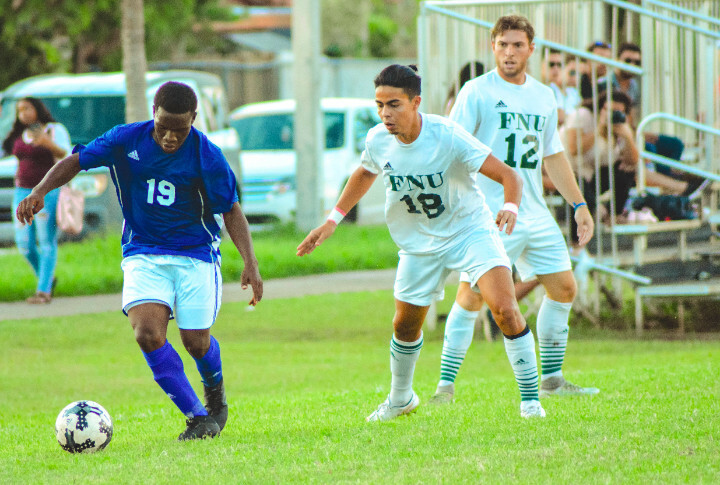 Nassau, Bahamas - The UB Mingoes men’s soccer team prepares to open the season Thursday August 23, 2018 against Penn State Altoona in Altoona Pennsylvania. The Mingoes also play Mount Aloysius College Saturday August 25, 2018 in Cresson, Pennsylvania as well as a part of the two-match opening tour. Head Coach Dion Godet says he has high expectations for the team that won the local Bahamas Football Association league last season. Godet says he’ll be looking at the overall play of the side over the weekend. UB Mingoes men’s soccer team goes through a final practice before opening their season Thursday August 23, 2018 against Penn State Altoona in Altoona Pennsylvania. The Mingoes also play Mount Aloysius College Saturday August 25, 2018 in Cresson, Pennsylvania as well as a part of the two-match opening tour. The side also travels without national team goalkeeper Julio Jemison who is nursing an injury. Godet says the team though is still strong considering this year’s recruiting class and the side’s other keeper. The side plays Penn State Altoona 7pm Thursday and Mount Aloysius College 5pm Saturday.